Philippine National Police spokesperson S/Supt. Dionardo Carlos clarifies statistics on Pres. Rody Duterte's War on Narcopolitics. Thinking Pinoy - RJ Nieto: We all know that there's only one news outlet (that reports 7000 EJKs), and it's Rappler.com. What has the PNP done to rectify that report? S/Supt. Carlos: When we saw it after the 1st 3 months (of the Duterte administration), we wrote to Rappler so they can correct it... and they did nothing. TP: When did you write to them? 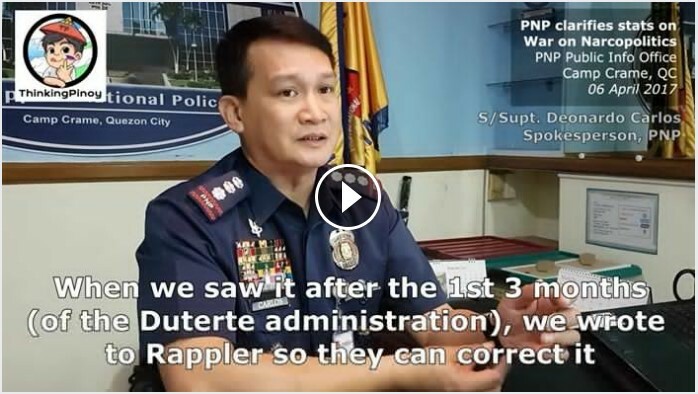 ...We saw that the (Rappler) article (shows figures) different (from what we provided), and they claim that the data comes from the PNP... Whenever I give them updates, I myself insert an accompanying note stating "Deaths Under Investigation are not automatically extrajudicial killings and these are crimes of murder and/or homicide (that are) still being investigated (on)." How can they say differently when clearly, every time that I release the data, we put something like that (a note) there? Care to comment, Glenda Gloria, Chay Hofileña, Bea Cupin, Maria Ressa? Update 04/07/2017: The PNP spokesperson's first name is spelled Dionardo, not Deonardo. This post and video originally appeared on Thinking Pinoy's Facebook page. "Despite the lack of evidence, relying solely on Pres. Rody Duterte’s fiery rhetoric, and without fully consulting the Philippine National Police, the opposition, led by vice-president Leni Robredo, propagated the grossly inaccurate death toll figure that “genius” Rappler employee Michael Bueza “computed”. It's time to set things straight." Thinking Pinoy added.